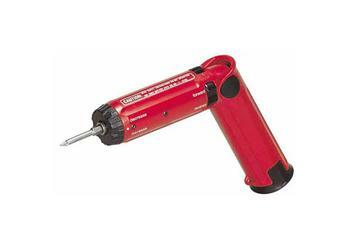 This cordless 2.4 volt Screwdriver has a 6 position adjustable clutch and two speed ranges, 0-200 and 0-400 RPM. With both forward and reverse this lightweight, 14 ounce, screwdriver is ideal for electricians, installers, assembly line workers, auto mechanics and general home maintenance. For comfort and convenience in tight locations, this tool has a two-position handle and is compact enough to fit into a pocket or contractor belt pouch. Adjustable swivel handle for tight applications.